As it looks now, I am going to fly to Solo on Wednesday, this city has and official name of - Surakarta -. There is an airport in the city at the epicenter of the Earthquake, however I guess it is closed. 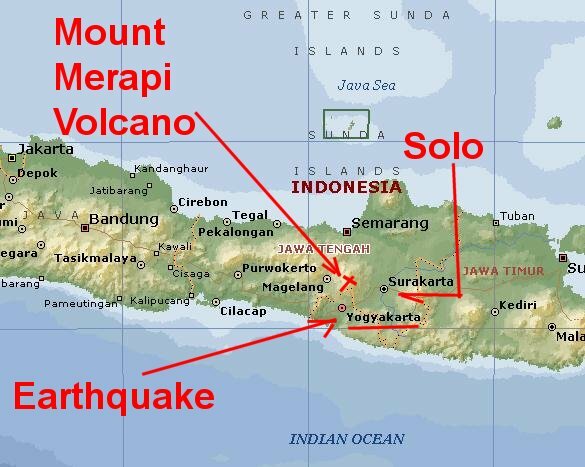 Solo is less than 50 miles from Yogyakarta or also the name of Djokjakarta. I thought I would need to fly to Surabaya, or maybe Jakarta, it is looking like I can get closer. I have not purchased the airplane ticket, therefore all plans can change. 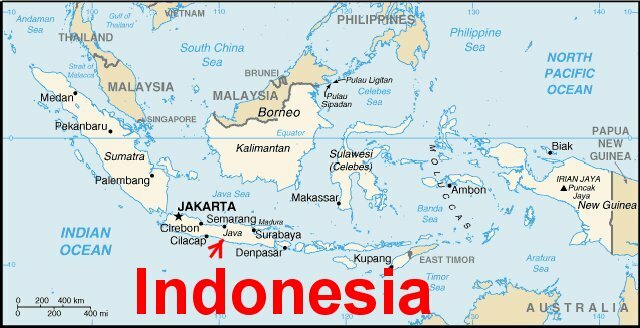 This is an overview map of the country of Indonesia. The decision to go to the Earthquake area become more obvious when you know that I wanted to go see the Volcano, then you see that the Earthquake is less that 100 mile away from the Volcano. Yogyakarta population of 477,000 people more or less. Airport close that is open. Solo population of 519,000 people more or less.